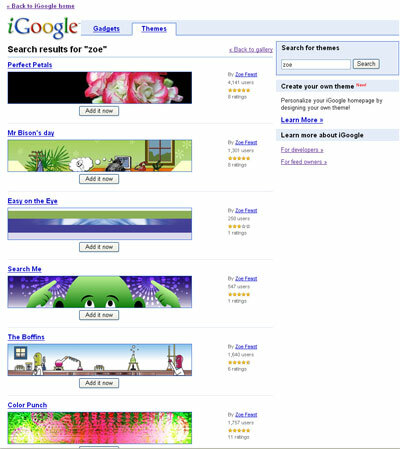 I took a look recently at how popular the themes I have created for i Google are and got a pleasant suprise. Perfectly Brilliant Elizabeth Deal – Jul 18, 2008 – Thank you for such a beautious theme. I love the brilliant color on a black background. I truely love it! Breathtaking Anonymous – Sep 10, 2008 – I love coming in everyday and opening my google site to this beautifully displayed flowers–it starts the day off right. Brava Brava Dolce2001@aol.com – Aug 2, 2008 – Thank you, Zoe Feast, for creating this truly unique, beautifully colored and visually pleasing accent for an iGoogle homepage. It’s not just the colors that I like, it’s the design that accents them. Well done! Outstanding! – Anonymous – Jul 5, 2008 – Very impressive..and easily worth a 5 star rating. Hope to see more of your stuff! Well done. Thanks you to everyone who has taken the time to rate and comment on the themes. This entry was posted in Chicago Graphic Design, Free!, St Louis Web Designer. Bookmark the permalink.